Should fourth- and fifth-grade students do homework? 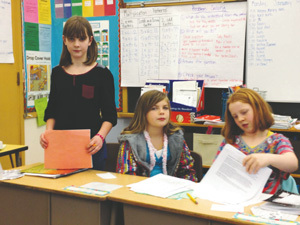 While many might think this is a no-brainer, approximately 75 students in Queen Anne and Magnolia public elementary schools formally debated this topic for the last several weeks, via a new after-school debate program, DebateAble. Other topics being debated: Is Justin Bieber better than One Direction? Should kids have cell phones? Should students wear school uniforms? But the program has little to do with the respective topic: DebateAble teaches students how to form an argument, refute the opposing position and argue in favor of the other side. DebateAble, now in its first session, was molded after a former nonprofit debate program in Queen Anne and Magnolia schools, Successful Schools in Action, which closed in 2011, after six years. Since then, the Queen Anne and Magnolia elementary schools have not had debate. DebateAble was launched in January 2012, with two intended sessions per school year, each 12 weeks long. The program took place in four public elementary schools in Queen Anne and Magnolia; it is now offered at all public schools in the two neighborhoods, including Blaine, Coe, Hay, Lawton and Queen Anne elementary schools. Each school has one to two classes, with 15 students each. The classes meet once a week after school for 45 minutes. Each session will culminate with a debate tournament between the schools. The current session’s debate will take place Jan. 26, from 9 a.m. to noon, at Catherine Blaine K-8 School (2550 34th Ave. W.). About 250 to 300 people are expected to attend. “They are learning to know different points of view and question them, rather than being offended in the way an adult would,” said co-founder Margot Saharic. “They have polite discourse on any topic, rather than an emotional one, and are appreciative of other points of view. These are skills every adult in America could use. “When I’m working with a group, a highlight for me is watching it click when they get it and watching them recognize they have the ability to put together an argument and spin it around to argue another position using similar arguments,” she added. The program has five coaches for the five classes. The founders purposefully employed teachers as the coaches, who are then trained to coach debate. “We felt we could teach curriculum to coaches but can’t teach coaches to be great with kids,” Saharic explained. Elizabeth Kruse, a co-founder, said she took the best debate curriculum elements from around the country — aside from the former program — and then modified them to cater to fourth- and fifth-grade students. The program is funded by student tuition; sponsors will help cover the costs of the tournament. A limited number of scholarships are available, depending on how much the respective school is willing to donate. Students were recruited for the program like they were for all other extracurricular activities the schools offer. The founders plan to take the program to other public and perhaps private schools. For the next session, starting in February, the main topic has not been chosen yet, and students might vote on what they’d like. For more information about the program, visit www.debateablekids.com. To comment on this story, write to QAMagNews@nwlink.com.